For many of us, trees are like old friends. They offer comforting stability in a world of rapid change. We protect them, fret about their health and look forward to seeing them. We revel in their beauty, relax in their shade and are calmed by the soothing sound of their leaves soughing in the wind. We spin tales about them and celebrate their special qualities. But trees are critically important in ways that go far beyond feeding people’s aesthetic sensibilities. By producing oxygen, reducing carbon dioxide, defending against erosion, nurturing plant and animal life and performing myriad other roles, they are the scaffolding that supports the health of ecosystems around the world. Our hills are home to many remarkable trees. Here we meet a few of them. This great oak probably played a central role when Mansfield was selected as the site of Wic-Can Fest. “The person researching a new site for our festivals at the time was a Druid, and Druids are very fond of oaks,” said Greymoon. 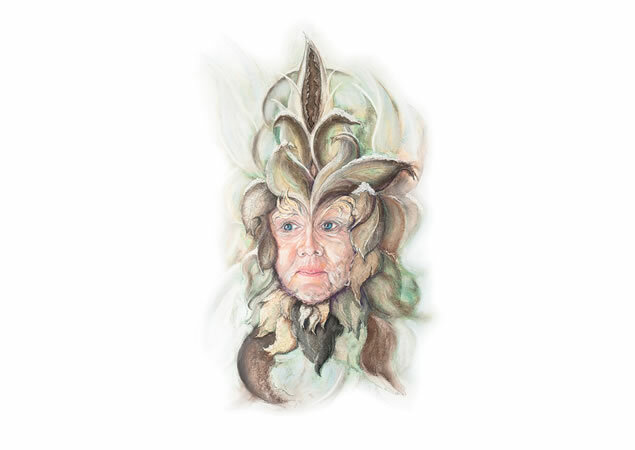 In fact, oaks are sacred to Druids – and it’s easy to understand why. These trees can live for hundreds of years and attain massive dimensions. Their muscular branches and sturdy trunks exude strength. Open-grown oaks, like the Mansfield tree, spread their limbs expansively, perhaps providing a subconscious reminder of the African savannah, where trees provided shelter and protection in humankind’s deep evolutionary past. 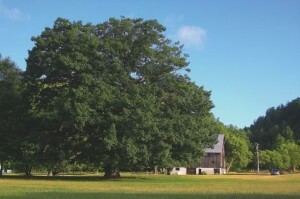 The Mansfield oak is 14 feet around and nearly 4.5 feet in diameter. The meadow surrounding the oak was cleared in the 1880s, said Outdoor Centre owner Ken Mikoliew. He guesses that by then the tree was already fairly large – large enough to stay the hand of the homesteader clearing the land. Assuming the tree was about 50 years old at that time, Mikoliew estimated its current age at 180 years. As I photographed this oak, a bluebird perched on one of its uppermost branches. Birds have an affinity for oaks, which support a rich larder of insects. In Bringing Nature Home, a book that explores how people can sustain biodiversity by nurturing native plants, Douglas Tallamy estimates that, in North America, an astonishing 517 species of caterpillars feed on oak leaves. Most songbirds, including seed-eating sparrows and finches, feed soft-bodied, nutritious caterpillars to their young. Simply stated, more oaks mean more birds. The largest tree I found while researching this article was another old red oak. 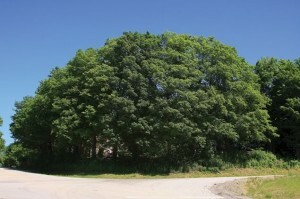 This tree, which grows on Second Street in Orangeville, is about the same circumference as the Mansfield oak, but the spread of its branches is even greater. 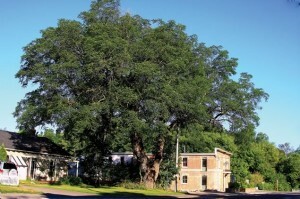 Owners Robert and Jodie McArthur have been told that, at an estimated age of 208 years, it may be the oldest tree in town. Taller trees punctuate our hills, but few, if any, exceed the overall dimensions of these monumental oaks. 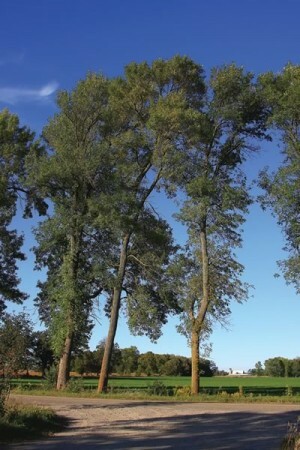 Mature elms are gloriously unique, with arching limbs perched high atop stately trunks. But the vast numbers that once dotted the Ontario landscape have been severely reduced by Dutch elm disease – and this enhances the appeal of the few large survivors. One of these, called “Henry,” grips the shoulder of Charleston Sideroad just west of Airport Road in Caledon. This tree is named after the late Henry Kock, a champion of Ontario elms. For more than two decades, Kock worked as an interpretive horticulturist at the University of Guelph’s Arboretum, where he founded the Elm Recovery Project. This project, now renamed the Henry Kock Tree Recovery Endowment, has since expanded to include recovery strategies for other tree species, such as ash, beech and butternut, which are also in decline. The elm recovery initiative involves taking cuttings from large healthy trees, grafting them to elm rootstalks, and then inoculating them with various strains of Dutch elm disease to test their resistance. Many of the grafted elms have shown promise and will soon begin to produce seed, providing hope that the elm-rich countryside of yesteryear can be restored. Another lovely roadside elm is found at the side of Wellington Road 124, just west of Erin. Being close to Guelph, this tree would surely have been on Kock’s radar. The eastern white pine is Ontario’s official tree, and in this province, white pines are emblematic of the Canadian Shield, where they grow abundantly. In the past, these trees were probably abundant in the hills as well, but because they were a favoured material for building barns and other structures, their numbers declined dramatically. 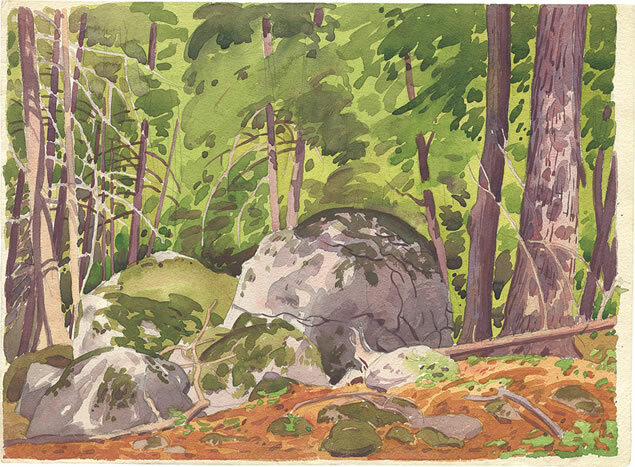 Pines sculpted by the wind were favourite subjects of the Group of Seven, and Rose Cancelli’s statuesque white pines on Kennedy Road in Caledon show why. Her trees lean perceptibly to the east, bowing to the influence of the prevailing winds. Cancelli loves these trees, and her feeling is understandable. 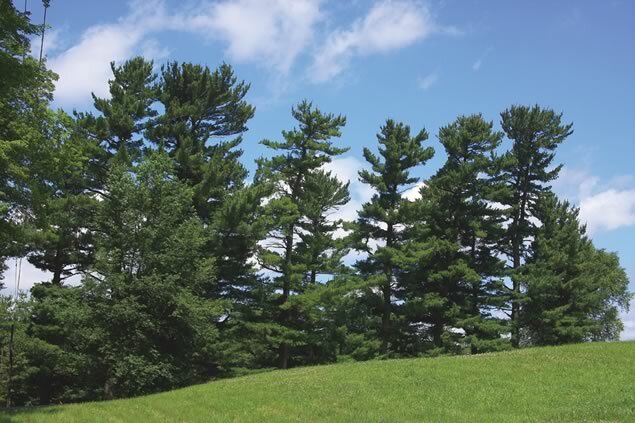 Mature white pines are truly beautiful. The largest of the pines lining Cancelli’s driveway is more than three feet in diameter, a big tree for this area. But elsewhere in the province, there are giants. The largest white pine in Ontario measures nearly six feet in diameter and stands nearly 150 feet tall. They are the province’s loftiest trees, often rising above woodland canopies to stand sentinel over maples, ash and oak. Barbara Shaughnessy grew up in the house Cancelli now occupies. Shaughnessy, who still lives in the neighbourhood, said that the white pines were one reason her parents bought the property in 1965. It seems that they, too, were wowed by the splendour of these trees. 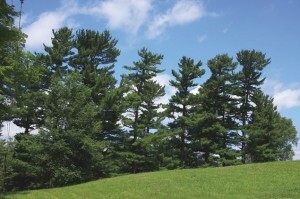 Recalling a story she heard as a child from an elderly man who visited her home in the late 1960s, Shaughnessy dated the planting of the pines to the early 20th century. The man told her that he remembered the trees being planted when he lived in the house as a boy. Cancelli, Shaughnessy and the elderly man are linked by their mutual admiration of the pines. And given that the potential life span of white pines exceeds 400 years, this society of admirers has room to grow in the years to come. Some of the oldest trees in the hills wouldn’t rate a second glance from many people. Small and gnarled, these trees often appear more dead than alive – but these characteristics sometimes signal extreme longevity. These senior citizens of the hills are the eastern white cedars that cling tenaciously to the cliffs of the Niagara Escarpment. 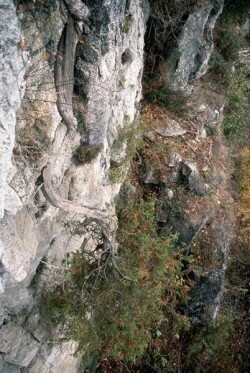 In 1988, Doug Larson of the Cliff Ecology Research Group at the University of Guelph, was astonished to find that some white cedars along the escarpment were more than 700 years old. Over the years, Larson and Peter Kelly, who joined the group in 1989, continued to count rings – and soon found living cedars older than 1000 years. The two told the story of these ancient trees in The Last Stand, which was published in 2007. In the past two decades, Kelly has twice examined the escarpment face at Mono Cliffs Provincial Park, most recently in 2004, as part of the Niagara Escarpment Ancient Tree Atlas Project. The oldest trees he found have been clinging to the park’s cliffs for more than 400 years. But Kelly has not had time to survey all the old trees in the park. “My guess is that there could be an undiscovered cedar close to 500 years old on the cliffs,” he said. The exact whereabouts of the oldest Mono trees are under wraps, but a visit to the park can inspire a little imaginary time travel. Consider that some of the cedars there began their lives at about the same time as Champlain was establishing the habitation at Quebec. In those days, the Headwaters region was largely unbroken forest sheltering a variety of animals – passenger pigeons, elk, cougars and wolverines – that are now extinct or displaced. First Nations people and an occasional French fur trader would have been the only humans on the landscape. In the fall, patrons of the Alton General Store would be wise to think twice before parking under the huge walnut tree on the opposite side of Main Street. Showers of billiard ball-sized walnuts can rain down at that time of year. Tom Colson, a former owner of the tree, remembers the fall he collected an entire ton of nuts. Three massive limbs – at one time, there were four – and their attendant branches are the source of this abundance of fruit. The limbs diverge from the main trunk less than 4.5 feet from the ground, the height at which the standard measurement of a tree’s diameter is calculated. This makes it difficult to compare the diameter of the Alton walnut to that of other trees. But this is a big tree by any reckoning. Below the point of divergence, the diameter of the trunk is nearly six feet, and the circumference is a remarkable 18 feet. The Alton walnut grows in the front yard of a house built in 1831, and the tree was probably planted at about the same time. Colson and his wife, Barb, lived in the house from 1986 to 2001. For the couple, the upkeep of the walnut was a labour of love. There were the usual chores – nuts to gather, leaves to rake – but with the tree hanging over Main Street, the task of cutting dead wood took on an urgency motivated by possible liability. The Colsons, who paid at least $500 a year to have dead and dying branches removed, steadfastly resisted the town of Caledon’s advice to cut down the tree. All who revere grand old trees owe the couple a debt of gratitude. In pre-settlement Ontario, black walnuts probably grew only in the province’s Carolinian zone. Over the past two centuries, however, these stately trees have been planted widely in the hills. Squirrels are helping them integrate into the local tree community by carrying their nuts far and wide. This is simply an acceleration of a natural process. Tree species have been advancing north since the last ice age, though the movement is largely indiscernible over a human lifespan. But humans have given walnut trees a helping hand, and they, like many people, have put down deep roots in the hills. 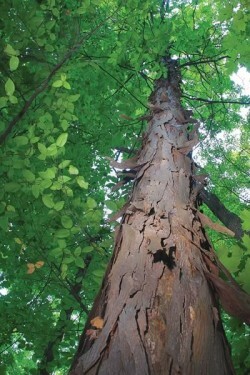 Shagbark hickories merit attention not because of their size, their age or their provenance, but because of their rarity and their namesake shaggy bark. One of the few shagbarks in the hills is found on the west side of the Bruce Trail, north of the Chinguacousy Road dead end. Linda Pim brought this tree and two others to the attention of Heritage Caledon, and they are featured on the Caledon Community Map. 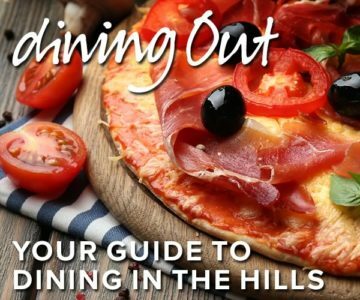 An Inglewood resident, Pim frequently hikes in the hills above the village and looks forward to her regular encounters with the hickories. A few other shagbark hickories are probably scattered here and there in the hills. And two isolated stands of shagbark hickory occur just south of Georgian Bay. One theory suggests that these outliers were planted by First Nations people who acquired the tasty nuts in trade. Headwaters residents would do well to follow the lead of Aboriginal people and plant these trees. Shagbark hickories are resilient trees, charmingly distinctive, and excellent for attracting wildlife. It would be wonderful to see these rare trees be given pride of place in parks and residential properties. 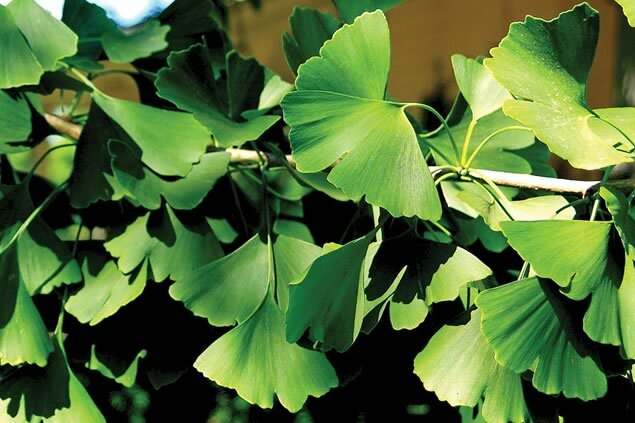 A fascinating non-native tree, the gingko – a.k.a. “the living fossil tree” – has been cultivated in China for thousands of years. 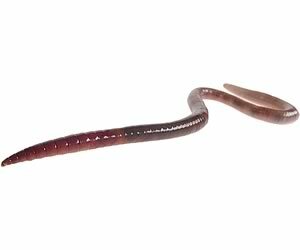 Its lineage stretches back 200 million years to the early Jurassic period, millions of years before Tyrannosaurus rex and Triceratops walked the earth. Long ago, these trees ranged over a vast expanse of the northern hemisphere, including what is now British Columbia. A lovely old gingko stands beside Caledon artist Diana Hillman’s home at Silver Creek Farm on Kennedy Road. The tree’s provenance is somewhat murky, but Hillman said a likely story is that it was planted by a doctor named Robinson, who grew up in Cheltenham and later moved to the United States to practise medicine. When Robinson returned to Caledon in 1890, he built the house that Hillman now occupies. In 1904, St. Louis, Missouri, hosted a world’s fair, where Japanese exhibitors offered rare gingko seedlings as souvenirs. Through Robinson’s connections in the States, Hillman suggested, he may have acquired one of the seedlings – and planted it beside his house. This explanation seems plausible. The gingko’s size and apparent age suggest that it could have been planted in 1904. Regardless of its origins, however, this graceful old tree is a noteworthy addition to local heritage. The provenance of some of the most notable trees in the hills is often a matter of speculation, obscured by the passage of time. The historic osage orange hedgerow of Torbram Road is no exception. The hedge “is thought to have been planted as a ‘living fence,’ likely for the purpose of animal husbandry with the possible secondary benefit of being a windbreak,” said Sally Drummond, Caledon’s heritage resource officer. The seeds of the trees that form the hedge may have arrived in the satchels of itinerant salesmen, who sold them to local farmers. Today, the Torbram site is the only surviving osage orange hedgerow in Peel Region. In 1999, the hedge became the first natural feature of cultural significance designated under the Ontario Heritage Act. As intriguing as the origin of this hedgerow is, it pales in comparison with the story of the osage orange itself. 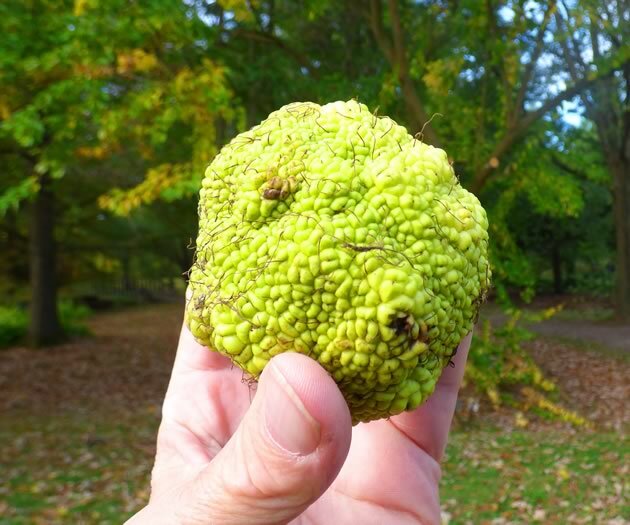 When Europeans first settled North America, osage orange trees grew only in parts of present-day Texas, Oklahoma and Arkansas. This is curious, because the fossil record shows that these trees once grew naturally as far north as Ontario, and the hedge’s well-established presence on Torbram Road confirms their hardiness here. 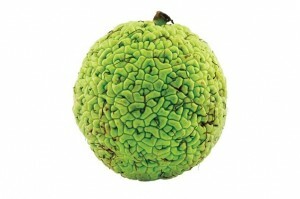 Scientists speculate that the osage orange was pushed south by glaciers during the last ice age. Afterwards, this tree was unable to repopulate the north because the wild horses, mammoths and mastodons that ate its fruit and dispersed its seed had become extinct. The osage orange had to wait until European settlers, recognizing its utility as a living fence, stepped in as surrogates for the extinct Pleistocene mega-fauna. 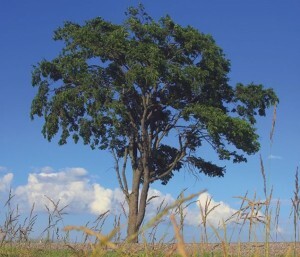 Ash trees are not well-known despite their abundance in the hills. They conduct their leafy business quietly, seldom graced with a second glance, except when their foliage glows yellow and purple in the autumn. The sheer volume of ashes, however, makes them worthy of attention. In urban areas, they often constitute more than 25 per cent of the urban forest. In the wild, they are important early successional trees, growing in sunbaked earth, creating the shade and humus necessary for longer-lived trees to gain a roothold. In woodlands, large specimens compete with sugar maples, reaching lofty heights to catch the sun. Our region boasts three species of ash: black ash grows in wet soils, and white and red ash grow just about everywhere else. Unfortunately, these trees are threatened by a bug of terrible beauty. The emerald ash borer is a stunning insect, with a shining exoskeleton of iridescent green. But this bug is also a natural-born killer, and since its arrival from Asia in the 1990s, it has destroyed ash trees across a wide swath of eastern North America. Sticky traps hang in Mono Cliffs Provincial Park as part of the Canadian Food Inspection Agency’s widespread effort to monitor and control the spread of the pest. The presence of the emerald ash borer has not yet been confirmed in the Headwaters region, but it is on the doorstep. It has been detected in Brampton, and it is also approaching from the west. Its arrival seems imminent, and when it appears, dead and dying ashes will suddenly stand out in the woodlands and on urban streets. This will be sad, not only for those who cherish trees, but also for the environment as a whole. No species of plant or animal lives in isolation. Countless insects depend on ash trees, and the death of these trees will create a ripple effect that could lead to a significant decline in biodiversity. The coming attack may be inevitable, but before his death, Henry Kock, who was active in the battle against Dutch elm disease, offered some ideas. He maintained that cutting down ashes and halting their planting was not the answer. Instead, he advocated a more sophisticated, ecosystem-based approach that included encouraging natural predators like bacteria, fungi, wasps and woodpeckers, which control the borer. And borrowing a strategy from his experience with elms, he also stressed the need to search out ash trees that remain healthy while others around them sicken and die. Rows of large, statuesque red ash trees shade Heritage Road north of Mayfield Road in Caledon. As the borer moves north, these trees in the southern portion of Headwaters may be among the first to succumb. Sugar maples are quintessentially Canadian. A stylized sugar maple leaf is the symbol at the centre of the Canadian flag. Sugaring-off is a rite of spring. The sap runs at about the same time as the Toronto Maple Leafs’ annual playoff quest falters. Sugar maples are Ontario’s most common large trees. Eliminate these maples, and the landscape would be embarrassed by its nakedness. 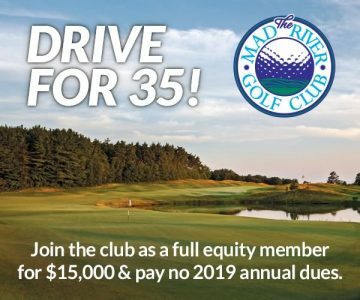 In the 1870s, farmers who transplanted maple seedlings from their woodlots to the verges of the roads bordering their property collected the tidy sum of 25 cents a tree from the Ontario government. Today, this program can be thanked for the lovely, mature maples that arch over so many rural byways. Sugar maples were also planted along lanes and around homes, contributing to the idyllic charm of the hills. Nineteenth-century schoolchildren did their part, too, planting maple trees around their schoolhouses. Watering, at least in dry years, would have been crucial for success. It is heartwarming to think of these children and their teachers tending their little trees and, when necessary, fetching well water to give them a drink. Today, most of these schoolhouses have been transformed into homes, and their residents are the beneficiaries of the tender care extended to these trees so long ago. But old age, pollution and soil compaction have taken a toll on this priceless legacy – and spurred Ken Jewett to action. In 2000, Jewett founded Maple Leaves Forever (see In The Hills, Winter 2009). His goal is to ensure that sugar maples will forever grace the landscape, and to this end, he is spearheading maple planting efforts in the hills and elsewhere in southern Ontario. Maple Leaves Forever began by using seedlings, but the organization now promotes the planting of five-foot maple saplings, which are better-equipped to withstand the predations of rabbits and rodents. 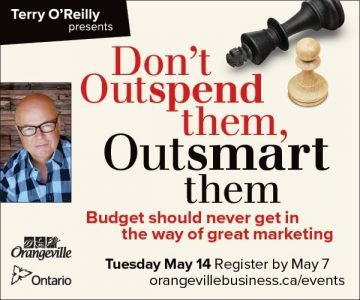 Jewett’s organization picks up half the cost of the maples, while the landowner pays the other half. 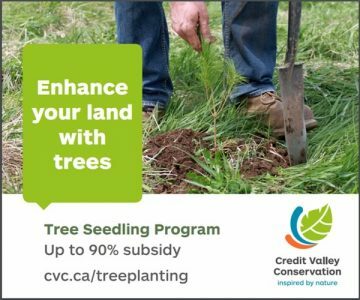 The sugar maples in the program are grown by some of Ontario’s largest nurseries from “zone-specific seed.” This seed yields trees suited to particular climate zones, and this helps the growing trees survive the vagaries of local conditions. Wonderful examples of 19th-century sugar maple plantings are found throughout the hills. Two of these are mentioned in the tour on page 33. The men, women and children who planted the trees that engender joy today, as well as those who had the wisdom to protect trees in their natural habitat, are owed a debt of gratitude. We can learn from their example and endow future generations with the priceless gift of trees. We can protect the trees we have. And we can plant trees. But this needs to be done wisely. Trees that are native to eastern North America are the preferable choice. Ontario’s glorious native trees – oak, hickory, maple, basswood, eastern white pine and many others – offer so much more to songbirds and wildlife than trees from Asia and Europe. If you have space, plant a diversity of trees. Harmful insects and tree pathogens can easily gain a foothold in mass plantings of only one or two species. Dabble in the unusual if you wish. Some of the trees currently restricted to the Carolinian zone in Ontario will eventually arrive in the hills on their own. Why not accelerate the process by planting a tulip tree, a pawpaw or a Kentucky coffee tree? Then, after lovingly placing it in the ground, you can relax with a cold beverage and ponder the tales that future tree fanciers will weave to explain its origins. Here is how to find the trees mentioned in this story. The tour starts in the north and moves roughly southward. Note that some of the trees are on private property. When this is the case, please respect the privacy of the residents and admire the trees from the public street or road. 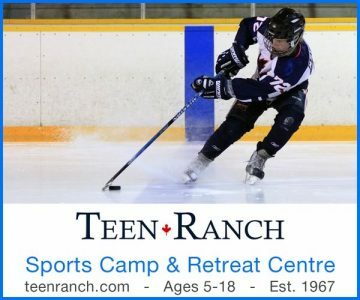 The Mansfield Outdoor Centre is on Airport Road about ten kilometres north of Highway 89. The oak is clearly visible from the parking lot. The main entrance to the park is on the Third Line, Mono, one kilometre north of Mono Centre Road. Follow the park’s trail system to the lookouts on the cliff faces. From Broadway, the town’s main street, go north to 46 Second Street. black walnut – alton This tree is on Main Street (Peel Road 136), just south of Queen Street and across from the general store. Find Henry on the south side of Charleston Sideroad, just west of Airport Road. Follow Wellington Road 124 (Main Street) to the south end of Erin village where the road turns west. This lonely tree is just west of the turn. 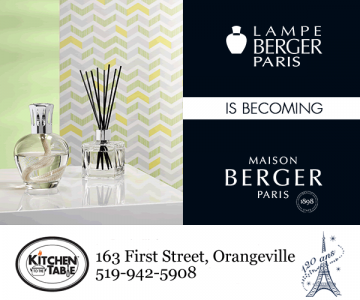 Silver Creek Farm is located at 16849 Kennedy Road between the Grange Sideroad and Escarpment Sideroad. Note: The gingko can be viewed this fall only during Silver Creek Arts Open Studio weekends: September 24–25, October 1–2 and October 8–9, between 10am and 5pm. View one of the many fine examples of maple-lined byways along Kennedy Road between the Grange Sideroad and Escarpment Sideroad. Find an excellent example of schoolhouse maples at Silver Creek Schoolhouse on the northwest corner of the Grange Sideroad and Kennedy Road. The pine-bordered laneway is on the east side of Kennedy Road about one kilometre north of Olde Baseline Road. This one requires a little effort. Drive to the end of Chinguacousy Road, just north of Olde Baseline Road. Hike about 300 metres north on the Bruce Trail. Cross two small wooden bridges. Shortly after crossing the second bridge, look for the shagbark on the left. The hedgerow is on the west side of Torbram Road, north of Old School Road. Ash trees border a section of Heritage Road between Mayfield Road and Old School Road. Father taught me to appreciate the very much bigger and very much longer story of trees and the people who love them. I am an amateur but enthusiastic naturalist in eastern Ontario. Through the years I must admit to largely ignoring the trees as I move about among them looking for something of interest. So often our focus at the distance blinds us to what is right in front of us. What a fine selection of photos, and the smaller inserts were a great way to get to know the trees up close too. We have an old and expiring tree on our property, which I do talk to from time to time. Your article made me feel that talking to a tree is maybe not as crazy as the rest of my family thinks it is. I’m guessing you too talk to a tree from time to time. It will be our little secret. Your article reminds me of the Ents (ancient trees) in the series, Lord of the Rings. They had a lot of slow-moving wisdom and power, and were great characters in the books. Yes, there is something slow and special about trees, especially big old trees like the ones you have decided to focus on here. Thank you, Don, for your fine article and for a wonderful reminder to appreciate the trees. We have, what I believe may be, the oldest White Willow tree in Quebec if not Canada. It is estimated to be 195 years old with a diameter of 5.4 ft. It is a majestic creation which reaches not only great heights but spreads a canopy over a large portion of our front yard. We have named our farm “Willow Lane” in honour of this giant which guards our lane way. It has over the years developed a large crater which almost splits the base of this beautiful tree in two. I have done what I can to help it survive. I am looking for advise and possible support in maintaining the life of this living giant.